John Sampson & Pete Baynes are A Fyne Pear! 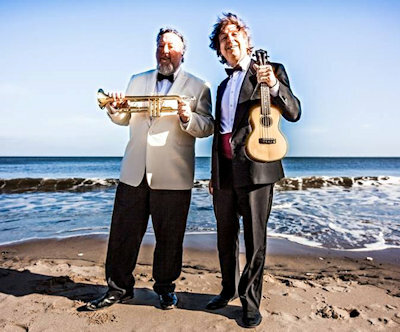 For forty years they have been making eclectic music on Ukulele, Trumpet, Recorders for every musical genre. Pete Baynes & John Sampson met in 1979 and worked together in the various incarnations of the legendary Cafe Grafitti. They wrote sketches, sang in a barbour shop quartet, and played many, many different forms of music; including as a duo. Pete trained at the Universities of Cardiff & Reading before heading to study in Paris. John came up through the Salvation Army and Napier University before touring with theatre companies and working for the BBC. 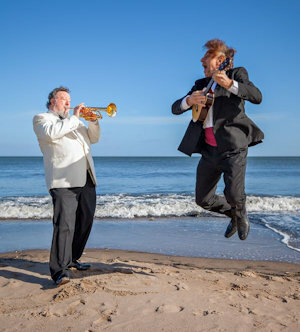 Throughout their long musical and theatrical careers they've always managed to play their brand of eclectic music - covering early music to swing and scottish music. 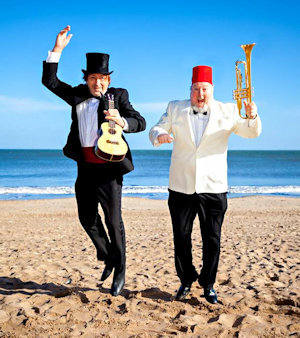 With Pete's songs and John's wind instrument versatility they appeal to all age groups and are ideal for weddings, corporate events, old peoples' homes and any event whatsoever!